Blog | Sturgeon Construction Ltd.
Cracks happen. Whether a recently constructed or older building, cracks do happen - it is inevitable. Buildings are not rigid structures; they shift and settle as the ground adjusts to the building's load, and the building adjusts to changing soil conditions as well as climate conditions. Concrete also has its drawbacks. Newly poured concrete is subject to drying and shrinkage during the curing process. Older concrete is subject to wear and tear as it ages. Concrete dries, the ground shifts and buildings settle as a normal course of events. With all this movement, cracks are bound to happen. Minor surface cracking such as hairline or frost cracks are generally no cause for alarm. Many building owners choose to repair these purely for cosmetic reasons. Deep horizontal, vertical or diagonal cracks that exceed ½ inch in width are a different story. 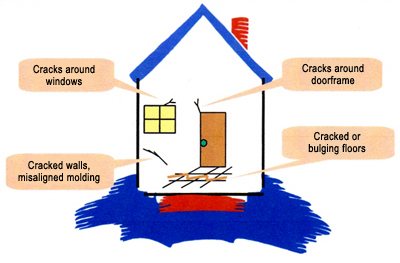 You need to understand the exact cause of the crack and the extent of the effect on the building's structure. These types of cracks require further investigation and a repair strategy to prevent further damage. Because a foundation supports the entire building, undetected damage can devastate the structure. Left unchecked, this damage can result in a) costly repair bills to secure and reinforce the foundation, or b) the total loss of the building itself. If you know what to look for, your home or building will provide you with plenty of clues that something is amiss. Some clues are less obvious than highly visible exterior cracking, but should not be overlooked. As a homeowner or commercial building owner, get to know your property. A peripheral check of the foundation wall should be performed every year. By becoming familiar with the exterior and interior of your building you become the first line of defense. Additionally, precautionary measures such as ensuring adequate drainage, ground slope and proper gutter or drain spout installations should become part of your regular building maintenance routine. Early detection is your best defense against structural damage. 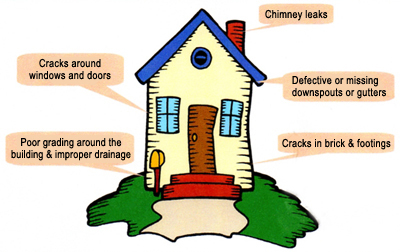 By performing periodic inspections to determine potential trouble spots, you protect your investment. Look for trouble spots; there are exterior and interior signs that will help you determine if your home or building is suffering from structural complications. Sturgeon Construction Ltd. believes that a well-informed customer is a well-armed customer. For that reason, we have put this information together to help you spot the less obvious signs that your foundation may be in need of repair. If you are uncertain about the condition of your foundation, it is alway best to get an expert opinion. Sturgeon Construction Ltd. employs experienced estimators who will provide you with a FREE, no obligation inspection. At Sturgeon Construction Ltd. our professional estimators will perform a complete check of the exterior and interior of your building with you. We will point out any signs of trouble and offer suggestions for improvements or proper maintenance. We will advise you of any potentially serious condition that requires further investigation and corrective action. The material contained on this page is for information purposes only. The details provided by Sturgeon Construction Ltd. at the time of publication are believed to be true. Information is subject to change without notice and Sturgeon Construction Ltd. assumes no responsibility or liability for any errors or omissions.